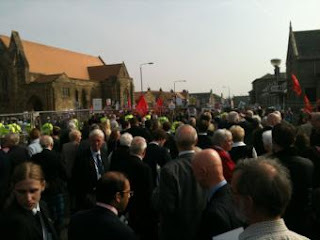 Over 1,000 STUC demonstrators against youth unemployment kettled Tory delegates attending their Scottish Conference in Troon as they tried to leave for lunch today, as Mike Kirby, UNISON Scotland Secretary and STUC President, condemned this week's budget as "tax cuts for the rich few while a whole generation is consigned to mass unemployment because of crazy austerity economics". Mike said that cutting the 50p tax rate was completely unacceptable while unemployment soars across the UK - and Scottish youth unemployment hits record level. "It is completely unacceptable for the government to cut tax for the rich few in society while a whole generation is consigned to mass unemployment because of crazy austerity economics", he said. "Freezing the miminum wage for young people is unfair and will do nothing to address poverty or joblessness. Over 100,000 young Scots are now jobless - that's the highest figure for a generation. And that's why the STUC called for the demonstration."